clamps | Product tags | Waltco Tools & Equipment, Inc.
Converts from a bar clamp to a spreader easily, no tools required. Quick release trigger allows for fast and easy positioning. Large non-marring stay-on pads that are soft, pliable and replaceable. Converts from a bar clamp to a spreader easily, no tools required. Used for clamping, assembling, gluing, positioning, leveling, and spreading. Quick change, multi-positioning, jaw can be positioned anywhere. Made of high-tech resin construction and heat- treated bar with strength, rigidity, resistance to gouging. Large non-marring stay-on pads that are soft, pliable and replaceable. Quick release trigger allows for fast and easy positioning. 7-1/2" minimum spreading capacity. 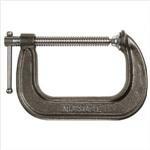 The invention of Quick-Grip bar clamps revolutionized clamping with the introduction of the first one-handed bar clamp. 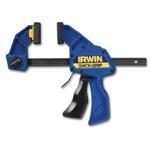 Now comes an even more versatile addition to the line of Quick-Grip bar clamps: the Quick Change bar clamp/spreader. It is quicker to use and more versatile. This 18-inch bar clamp changes into a spreader as quick and easy as 1,2,3. No tools required. The Quick Change multi-position jaw can be positioned anywhere on the bar making even the most challenging clamping or spreading task a snap. 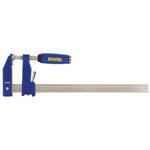 This Quick Change Quick-Grip Bar Clamp/Spreader has a clamping capacity of 18-inches, and a spreading capacity of 7-1/2-inches to 26-5/8-inches. The quick one-handed operation means less hand fatigue, and combined with the ability to easily slide the handle into position by engaging the metal Quick Release Trigger, clamping has never been so quick. 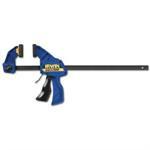 The Ergonomic Pistol Grip provides a comfortable grip and concentrated clamping pressure. 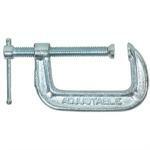 This 18-inch bar clamp/spreader comes with non-marring, stay-on pads. These pads are designed to firmly stay in place while clamping, yet they are easy to remove or change, if desired. 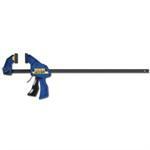 The Quick Change bar clamp/spreader is manufactured with quality and pride in the USA. Full lifetime warranty. Each Quick-Grip clamp is warranted to be free from defects in material and workmanship for the life of the tool, except for damage caused by abuse, misuse or alteration.